At Overstock you will find everything you need at rock bottom prices. Check off your whole list, because Overstock carries luggage, furniture, housewares, bedding, clothing and shoes, jewelry and watches, electronics, books, software, stationery, and so much more. In addition to shopping, you may wish to take part in auctions, buy and sell cars, shop for real estate, or even join the Overstock community. Overstock sells luggage including briefcases, suitcases on wheels, duffle bags, laptop bags, back packs, and more. You can shop for furniture for your living room, dining room, bar, office, or patio. Everything you need for home decor, like rugs, housewares, home improvement tools, and more can be bought from this store. Apparel is available for men, women, children, and infants. You can also shop for hand bags and other accessories, sunglasses, jewelry, and watches for both men and women. Electronics such as televisions, cameras, iPods, DVD players, and computers are all available at this store. Shop for fitness gear, golf gear, and sporting goods too. Books, movies, video games, software and magazines are all here. Overstock wants to make sure that the customer is satisfied and has a return policy that accepts unopened items within 30 days of purchase, as long as you meet the other return policy details. Please check the website for these details. The store offers shipping at a nominal cost to the contiguous 48 states. 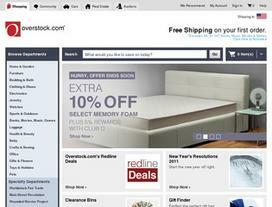 Overstock gives a low and best price guarantee to all of its customers. Despite Overstock's huge stock, the website is extremely user friendly and easy to navigate due to its systematic design. All items are categorized under broad headings making it easy for a buyer to locate products. Additional sales can also be found on the website. Sign up to receive news of their latest offers, products, and discounts via email. Check out the FAQ section to find the answers for many of your questions. It is a pleasure to shop at Overstock because you can buy a whole list of things at one single store, and this saves you time and effort, especially when it can all be accomplished online. You will be sure to become a regular customer once you make your first visit to Overstock and start saving. Share what you think about Overstock, and your favorite ways to save there!